The SIK Binder is much more than your average instruction manual - it is an entire course worth of curriculum designed to make teaching embedded electronics easier, more intuitive, and more fun. 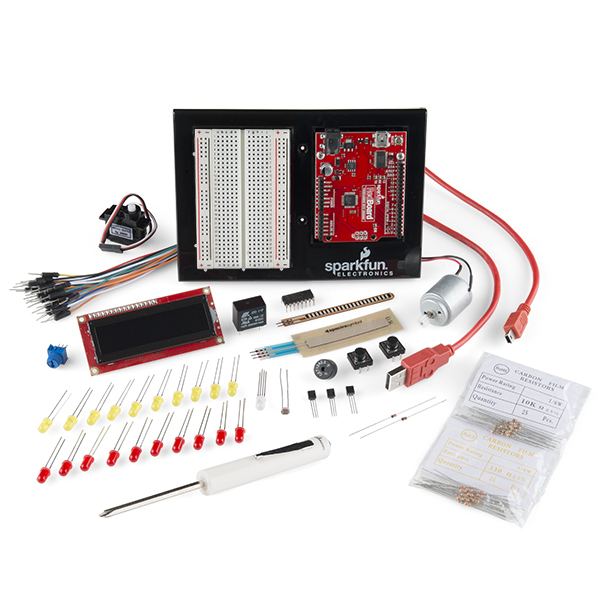 It was written with teachers in mind, and features not only step-by-step instructions on using the SparkFun Inventor's Kit, but the supplemental materials you need to make electronics part of your classroom. This binder includes everything you need to start exploring the world of Arduino - including instructions on getting set-up, a section explaining common electronic terms and theories, and the basics of programming. It also includes worksheets for both middle school and high school students and even physical activities you can use to teach kids physical computing concepts. The binder also includes 14 "circuits" of varying difficulty which make the binder appropriate for a wide-range of ages and skill levels. From the most novice student to a seasoned electronics enthusiast, everyone can learn from this useful text. The SIK Binder is also released as an open source text, meaning any teacher is free to download, use, or change the text to suit their needs. If you have more questions about the SIK Binder, please contact us at education@sparkfun.com.